Every 24 minutes, Europe’s highest open-air cog railway departs from Zermatt towards the sun-drenched, year-round accessible Gornergrat viewing platform at 3,089 metres a.s.l. Surrounded by no fewer than 29 4,000-metre giants such as the majestic Matterhorn and the Dufourspitze as well as the third-longest glacier of the Alps, Gornergrat rewards visitors with a view that is overwhelming indeed. The Gornergrat is among those locations that one must have visited at least once in a lifetime. 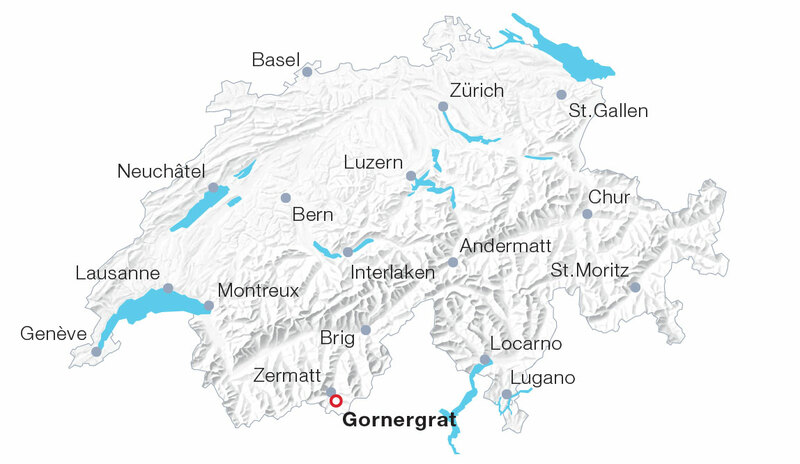 Europe’s highest open-air cog railway takes guests from Zermatt station directly to the summit of the Gornergrat, year-round. The railway conquers a total of 1,469 metres altitude in the process and leads across impressive bridges, through galleries and tunnels, past larch-and-pine forests, rocky ravines and mountain lakes. Attractions: View of the glaciers of Monte Rosa, reflection of Matterhorn in Lake Riffelsee (visible in calm weather), journey with the Gornergrat cog railway to 3,089 m a.s.l.